Legend has it that the Wind in Wangdue comes from a hole in the elephant hill. And many still believe so, finding no geographical justification to why Wangdue should be so windy when places around it are calm. 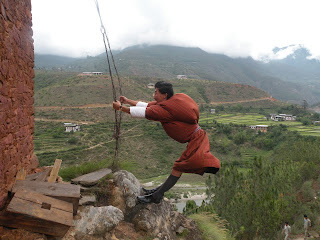 To add more gravity to the legend, the wind at the southern end of the Wangdue Dzong is man-blowing; if you haven’t been there you don’t really know how windy the windy Wangdue is. The gigantic prayer flag on the hill waves ferociously with sound enough to surpass twenty scooters starting at once, every blade of grass points in the direction of the wind, trees seem to have lost much of their leaves to the wind… every inch of the hill spells out the power of the wind. I went looking for the hole, from the head to the tip of the trunk of the elephant hill. I wanted to photograph the wind at its source, but the legend remained a legend- I couldn’t find the hole this time. But the wind blew me into wonder- is so much power going to go wasted everyday in blowing dust around? Or embarrassing and shy girl by blowing up her kira, or by blowing off a bald man’s hat? Can’t it be harnessed into useful energy- to pump water or generate electricity? Because even if there is no wind hole in the hill there is undeniable power of wind sweeping the hill at all times. I am really enjoying reading your articles. Infact this very article on wind-hole in Wangdue is really thoughtful article. You are really a good writer/blogger. Keep it up! By the way I also hope that you are enjoying your profession to fullest and imparting the skills and knowlegd that you possess to your students. Best of luck in your search for the wind hole. People from Wangdue says that it is there: at the confluence of Dangchhu and punatshangchhu. But I apologize for not being about to impart my skills to my students. Even Education Secretary hopes I do that. But honestly I can only inspire, if they find basketball more fun than blogging, then I have to tell them how to find joy in basketball. But now it's all a different story... Even the new town is infected with old dirt. @ Thanks Monu. Well, I will go on search for the Wind-hole for sure but interestingly everybody has heard and no one has seen... even you have heard, and people who told you must have heard too..ha ha ha I will blog if I find it!